It’s that little box in the header of your website. Visitors use it to search for things. It’s usually called a “Site Search” and it helps people find what they’re looking for fast. It’s a way to help your visitors. But for the marketer, it’s an incredible listening tool. The site search tool gives you a peek into what your visitors want from you and your website. And sometimes, it shows you what your visitors can’t find. It’s an amazing way to find and fix content gaps. It’s not set up in Analytics by default because websites are custom. A lot of sites don’t even have a search tool (only 54% do according to our research). Some sites have them in just one section (on this website, it’s just in the blog) and some sites have more than one search tool! On the search results page, look at the URL in the address bar of your browser. The phrase you searched for (“test”) is probably there in the URL. Note: If the word “test” is not in the URL, you’ll need to contact your developer to help you set up your Site Search reports. 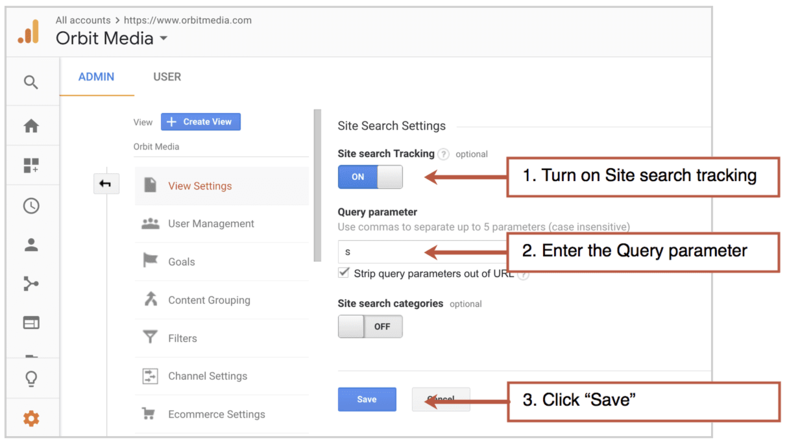 You can find instructions for tracking site search without query parameters here. 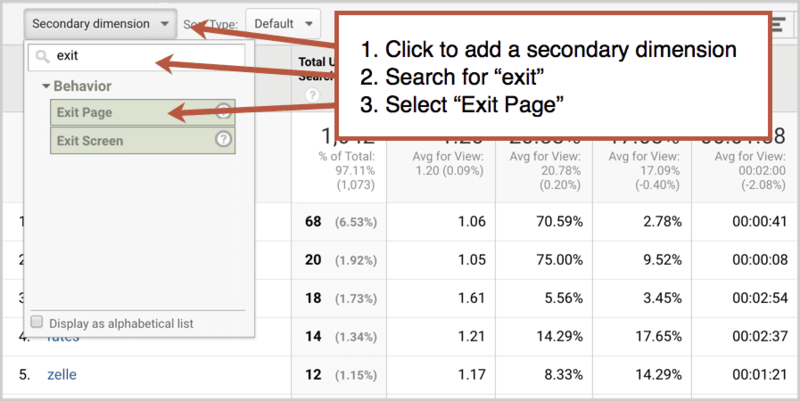 Because Google Analytics can see what’s in the URL and the URL contains the search term, it can capture and report it. But you have to tell it where to look. 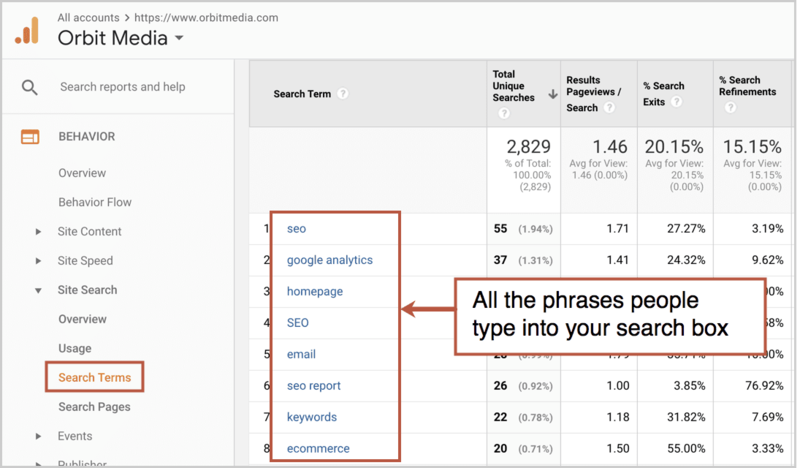 You have to configure Site Search tracking in Google Analytics by adding the “query parameter.” This is the letter or word that appears just before the equal sign and the search term. The query parameter is often ‘s’ or ‘search_term’ or something similar. Note: If you just set this up, it may take a few hours or longer to start seeing data. Also, there are two other settings here: a checkbox to strip out query parameters and toggle to turn on Site search categories. Unless the search tool is a key feature of your website and a primary way in which visitors get around, I recommend clicking the box and leaving the search categories toggle off. That’s it! Your Site Search tool is set up and you’re ready to start listening. Now we can eavesdrop on our visitors a bit, see what they’re looking for. The report we’re looking for is in Behavior > Site Search > Search Terms. It lists all the phrases that people type into your search box. If the numbers in this report are very low, choose a longer date range to get more data and insights. This section also has some other interesting reports. Overview: Actually, not very interesting. 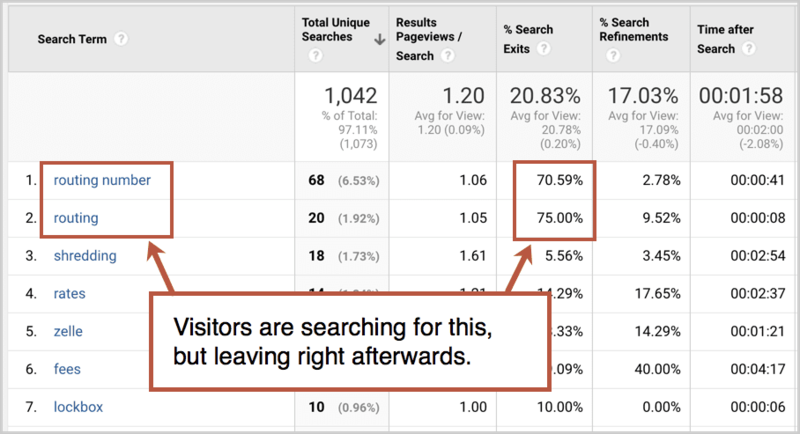 Usage: What percentage of visitors are using your search tool? Lots of visitors? Search Pages: From what page do visitors start their search? 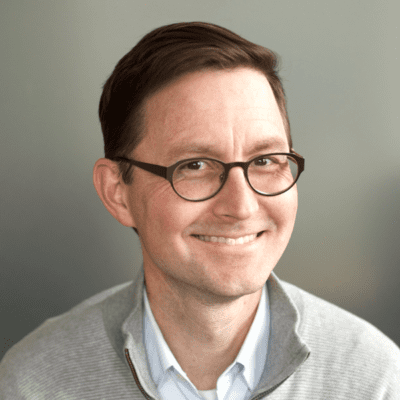 This is important if your site search is “global” on every page of your website, rather than just in one section, such as the blog or product catalog. The insights from this report are often so obvious that I’m guessing some of you readers just left and will never finish this article. The usability problems and content gaps are leaping out of Analytics and onto your to-do list for today. But if you’re still here, let’s do some analysis. First, pretend you are the visitor and search for the top three phrases that they search for. What do you see? Anything unexpected? Are you having the experience you want them to have? I bet I just lost some more of you. The issues are so obvious that you don’t need any suggestions. Still haven’t left? Great. Here are some examples of insights. These are examples of what your visitors are trying to tell you. 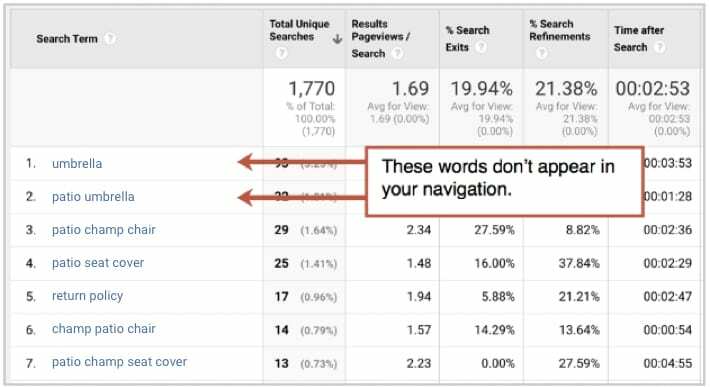 Your visitors are searching for “umbrellas” because they don’t see it in your navigation. Your navigation says “Shade Solutions” which is a weird term that people never say. Unless you’re a marketer… It’s going to be hot at the beach today. Don’t forget your shade solution! Action! Change your navigation labels to align with the phrases your audience is searching for. You are a construction equipment dealer. 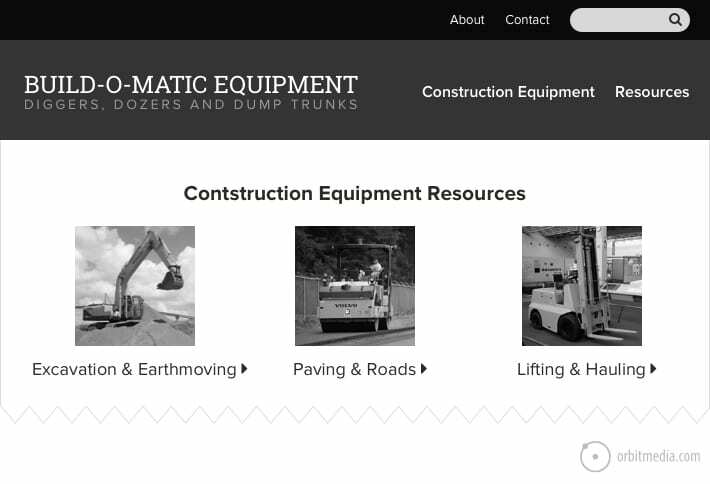 Your website has a resource center with guides for buying all kinds of machines. It’s a big section, so it has a search tool. The page gives them three big options. But since they don’t see what they want, they search. Action! Add “bulldozers” to one of the labels, give it it’s own section or make one of the images a bulldozer! But look more closely at the data. See the “% Search Exits” column? Most people who search for this leave the site after searching. They leave before clicking again. They leave without finding anything! Now you’re looking at a list of what people search for and the last page they visited. You can tell right away that some people find what they’re looking for and others leave from the search results page. They never clicked. They left without the information they needed. This is called the “Report of Broken Dreams” because it shows you what your visitors searched for, but didn’t find. Action! This should be an easy fix. Search for the phrase yourself. What do the search results show? If you don’t already have a page on this topic, make one! If you do have a page but it’s not ranking, update the page so it ranks higher for that keyword in your site search results. Put the phrase in the title, header and body text. Now search again. All better? Site search SEO is a type of optimization that everyone should love. Make your own content rank in your own search tool on your own website. You are a tax advisor. Your firm offers a lot of services, your site has a lot of pages, so of course, you have a search tool. You check to see where people are using this tool by going to the Behavior > Site Search > Search Pages report. Not surprising, a lot of visitors search right from the home page. But what about the other pages? Are they missing some key information? 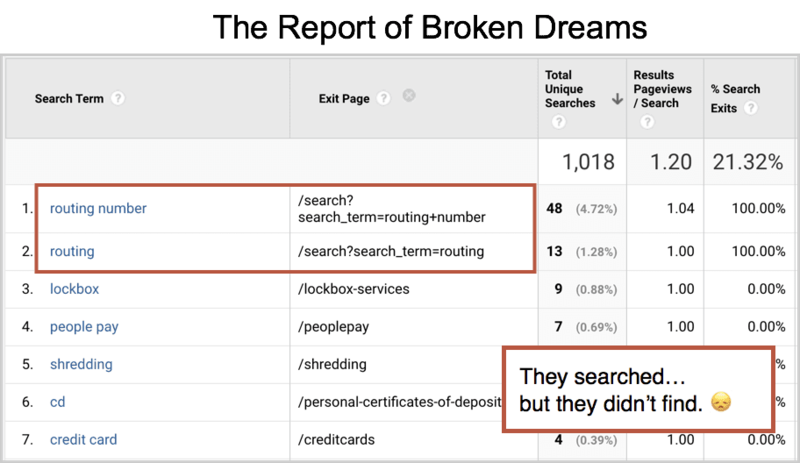 By adding the “Search Terms” as the secondary dimension to this report, you can see what people search for from which page of your site. A powerful combo! It looks like one of your pages is missing some specific information. 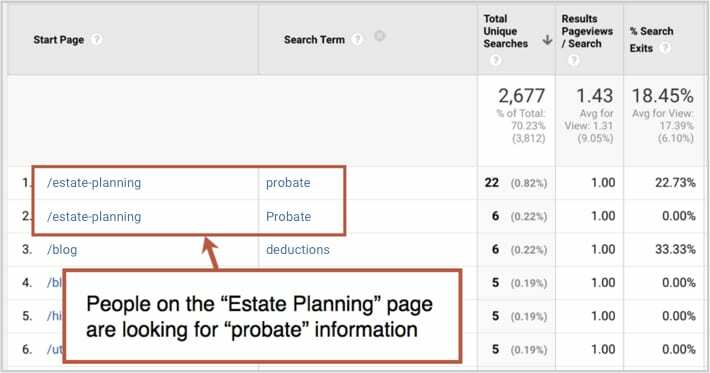 People on the Estate Planning page are looking for something called “probate.” I’m not sure what that is, but you probably do. Action! Add the missing information to the page. If this info is already on another page, you can also just add a prominent link, directing the visitor to the second page. Your visitors would rather click or tap than type. 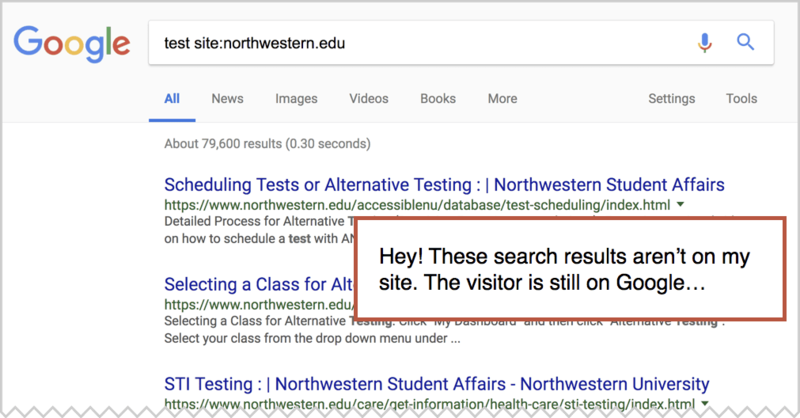 They don’t really want to use your site search tool, but if they don’t see what they want, they’ll use it as a last resort. It’s a far, far distance from the mouse to the keyboard. It’s even further on mobile. Don’t force them to make the jump. Check your Analytics to see who is crossing that chasm and then build a bridge so your next visitor doesn’t have to. Bonus! Is Google stealing your site searchers? But do you see anything else? 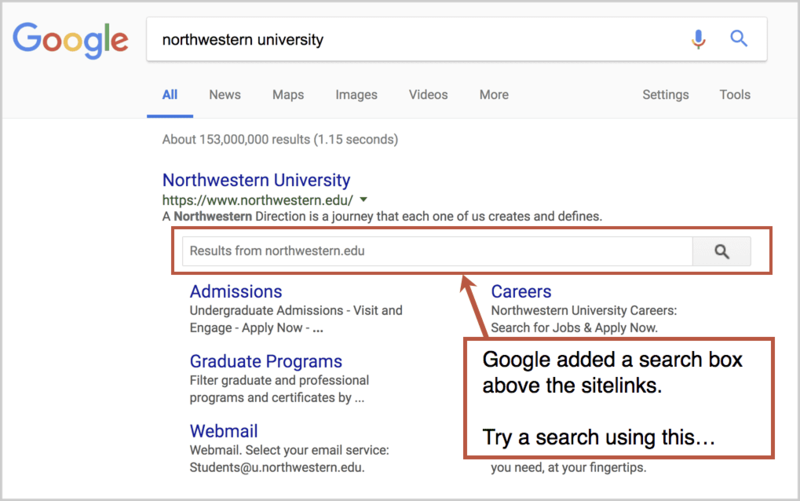 Do you see a search box right above your sitelinks? This is common for big sites and well-known brands. If you do, try a search using that search box. What do you see? Are you on a search results page within Google? Option one: Send those visitors to your site for their search results. This will let people search your content faster, right from Google, but it gives you the visitor. To do this, add this code to your homepage, editing the URL and target fields for your site. If you want people to visit you first and search your content later, you can remove the search box from above your sitelinks, just like Amazon does, by adding this code to your homepage. Now your visitors will have to come to your site, experience your brand and your design, before searching your content. Got any data-driven empathy tips of your own? Share with your fellow readers by leaving a comment below! Hi Andy…after setting this up, no search data is coming up for me. Do you think it has something to do with GA not being set up to look at https? (I know I should know the answer to that!). Numbers are loading just fine in my Audience Overview page, so I’m not sure that’s it. Excellent article! Site search is a goldmine of information for content ideas and it can let you know which information to display, prominently accessible, to users of your site. Thanks for explaining how to set this up properly! Your keyword search tips are always so helpful. I found a few new things to do with my reports, thank you!